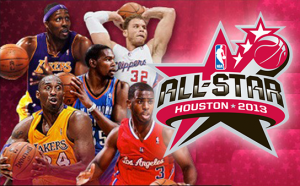 This weekend the NBA will stage its All-Star game in Houston where the Western Conference will be looking to play off against the Eastern Conference once again. Which conference will win the All-Star game and who will win the Slam-Dunk Contest? The Western Conference has Oklahoma City Thunder MVP Kevin Durant starting joined by the LA Lakers’ Kobe Bryant and Dwight Howard and the LA Clippers’ Blake Griffin and Chris Paul. The rest of the team will consist of LaMarcus Aldridge, Tim Duncan, James Harden, David Lee, Tony Parker, Zach Randolph, and Russell Westbrook. On the Eastern Conference starting lineup is the New York Knicks’ Carmelo Anthony, Miami Heat’s Dwyane Wade and LeBron James and the Boston Celtics’ Kevin Garnett and Rajon Rondo. The rest of the team includes Chris Bosh, Tyson Chandler, Luol Deng, Paul George, Jrue Holiday, Kyrie Irving, Brook Lopez and Joakim Noah. The Slam-Dunk Contest is also being held this weekend with James White 5/4 favourite to win. He is followed by Gerald Green and 7/2 and Terrence Ross at 4/1. Defending champion Jeremy Evans is 5th favourite to win with odds of 8/1. The Three-Point Shootout has Steve Novak and Stephen Curry as 5/2 favourites to win followed by Kyrie Irving and Ryan Anderson at 4/1.